Above: Roee Talmor, ’17, Alli Hugi, ’18, Professor Claudia Flores, and Amanda Ng, ’17, in Myanmar. In Tunisia over spring break, Vera Iwankiw, ’17, learned some of what the Internet couldn’t tell her about violent extremism and human rights. 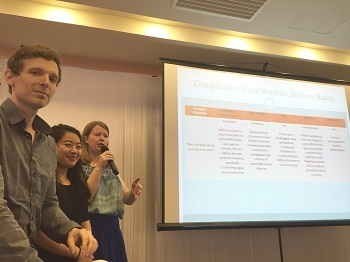 Iwankiw and other members of the Law School’s International Human Rights Clinic had prepared for the trip by researching the interplay between gender issues and ideologically motivated brutality in Tunisia, Kenya, and the United States. She and her classmates had been asked to investigate how women were affected by security efforts such as community policing, development programs, and community engagement and dialog? Were their voices being heard? How did attitudes and efforts vary from region to region, and from country to country? These weren’t easy questions to answer sitting behind a desk. But when Iwankiw, Kaitlin Beck, ’17, and their professor, Claudia Flores, the clinic’s director, arrived in Tunisia and began meeting with UN agencies and local NGOs, a fuller picture—one marked by a striking tension between security and human rights—began to emerge. They heard about the government’s efforts to address violent extremism without trampling fundamental protections—and about the frightened citizenry who seemed willing to trade those protections if it meant stamping out brutality. They met domestic violence advocates who drew a hard line between women who were involved in extremist aggression and those who were not, endorsing punishment for female radicals despite knowledge that many are coerced into joining extremist groups. The students—who would eventually use their observations to write a report that will further inform the work that the United Nations Office for the High Commissioner for Human Rights is doing on gender and PCVE (preventing and countering violent extremism)—also saw how security programs sometimes reinforced underlying gender stereotypes. They began to more fully understand how women’s needs should be incorporated into the battle against violent extremism. In-country field work is essential to human rights advocacy in large part because these types of insights are only possible in context, said Flores, who guides the students through months of desk research before they travel abroad. Either Flores or the clinic’s associate director, Brian Citro, a Clinical Lecturer in Law, accompany students on trips. This year six students traveled to three countries for two different projects. Nabihah Maqbool, ’18, traveled to Kenya to study violent extremism (see sidebar for a first-person account of her experience), gathering perspectives and information that she would later share with Iwankiw and Beck. Amanda Ng, ’17, Alli Hugi, ’18, and Roee Talmor, ’17, traveled to Myanmar to examine efforts to deal with land disputes that had arisen from decades of internal conflict and the more recent efforts toward democracy. Before heading to Myanmar (also known as Burma), Ng, Hugi, and Talmor had done extensive comparative research, looking at land restitution efforts in other countries that had experienced ethnic strife, such as Bosnia-Herzegovina, Kosovo, Iraq, Zimbabwe, East Timor, and Indonesia. But the real understanding came when the students began meeting with advocates in Myanmar as part of their clinic project with Oxfam. “It’s hard, even being prepared and doing research in advance, to understand the context without going to a country,” Ng said. Myanmar, they learned, faces a complex host of issues related to land ownership that can vary by region. Technically, all land in Myanmar is owned by the government, which can grant ownership or lease private property to individuals—as well as rescind those rights later. In some areas, leadership disputes mean competing governments sometimes hand out titles for the same piece of land. In other areas, people who had been displaced during conflict have struggled to reclaim property. For students in both groups, the visits allowed them to begin teasing out themes and thinking through their recommendations, which they discussed with other members of their projects. Now, they had imagery and first-person experience to flesh out the facts, and they had built trust with stakeholders in the countries they’d been assigned to research. Nabihah Maqbool, '18, on her work in Kenya.